Quined Games B.V. is a Dutch publisher of board- and cardgames. The company was founded in 2005 and is still led by Arno Quispel, who is doing the company's work in his spare time, since he has a full-time job as an attorney. Co-founder and brother Frank Quispel left Quined Games on january 1th 2013. Quined is an abbreviation for "Quispel Nederland", and -when pronounced fast- it sounds like "Kwin ut", which is phonetically Dutch for "k win het" ("I win it"). In 2005 Quined (co)produced Reef Encounter and Siena for the Dutch market and at the end of 2005, starting with their third coproduction Caylus, they joined hands with White Goblin Games for years to come, resulting in QWG Games (Quined White Goblin). QWG Games produced many boardgames for the Benelux market, but one of their most succesfull projects was the Master Print series: first in Dutch language and with known games as Master Print version, later on -due to international succes- in four languages and new games as Master Print version. Due to different market ambitions QWG split up again at the end of 2009. 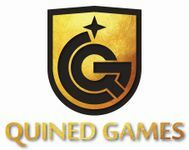 Quined Games now produces multiple games a year in the Master Print series.